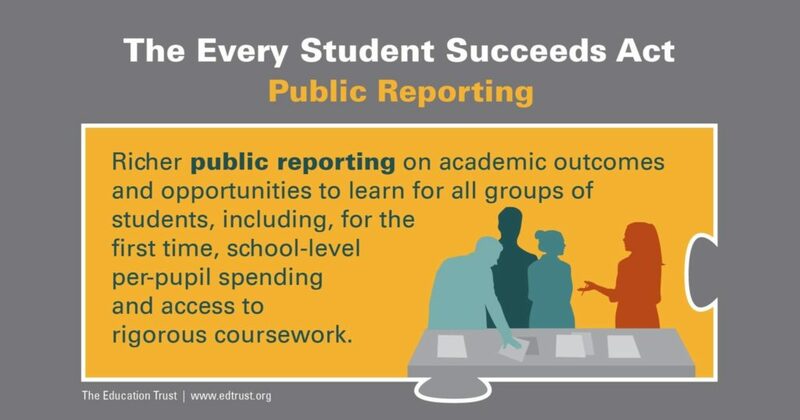 Why does public reporting matter for equity? Information on how all groups of students are performing academically, and whether all groups of students have access to key resources for learning, is a key tool for parents making important decisions for their children, as well as for parents and community groups working to spark necessary improvements. Disaggregated results on all accountability indicators, including state assessments and graduation rates. Districts and state report cards must include comparisons of high-poverty and low-poverty schools on these metrics. State, local, and federal per-pupil expenditures, by funding source. These expenditures have to include actual personnel expenditures for each school, not just district averages. The number and percentage of students with the most significant cognitive disabilities taking the alternate assessment. At the state level, results of the National Assessment of Educational Progress, as compared with national averages. Disaggregated rates at which high school graduates enroll in higher education, if available. How can states present all of these data in a way that is understandable to parents and community leaders? Will states make these report cards available in languages other than English? What kinds of tools, training, or accompanying materials would help parents and advocates use this information to fight for stronger opportunities to learn for all children?